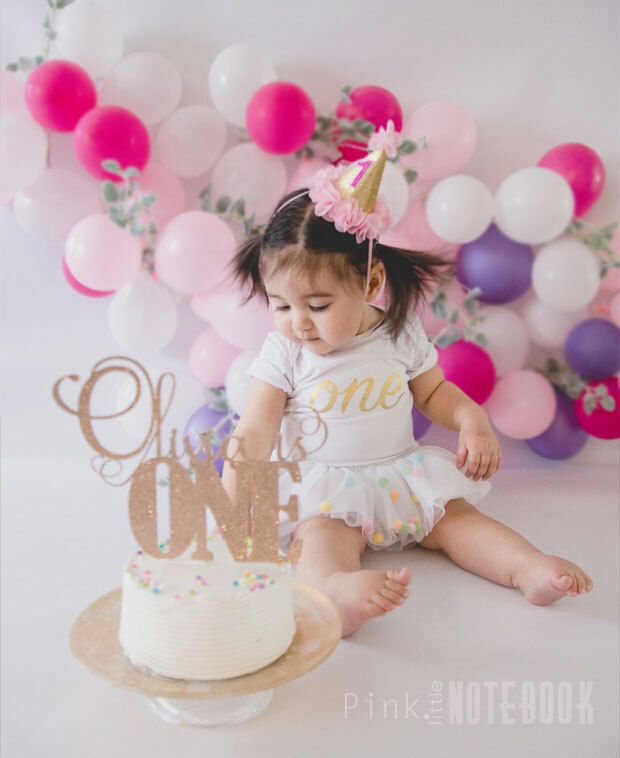 A few weeks ago we celebrated Olivia’s first birthday! This little girl has taught me so much. She’s smart, she’s lovable, she’s bigger than life. She truly amazes me everyday! When it came to throwing her first birthday, we decided to have the party at home. Of course, I don’t take decorating lightly around here. It’s what I love to do and, yes, I spent more than a few long nights trying to complete these details. 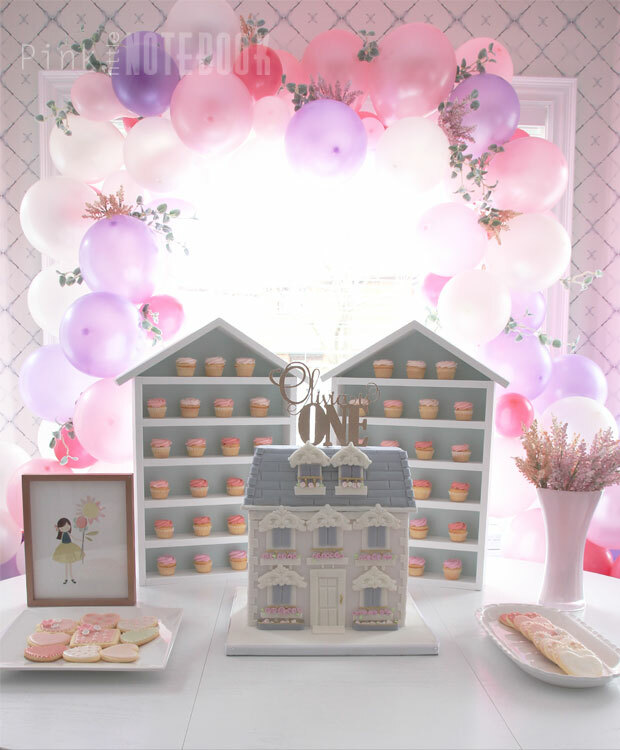 My idea for a doll themed party stemmed from Olivia’s nursery. 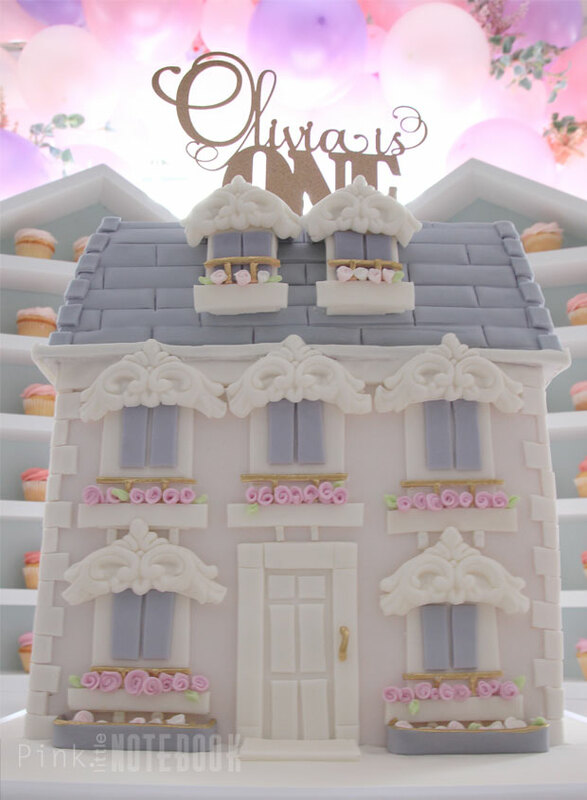 The house silhouette painted on her wall is everything little girls’ dreams are made of. I wanted to re-create the look and feel for her birthday. When I came across this image from Paper Jam Studio, I was totally inspired. 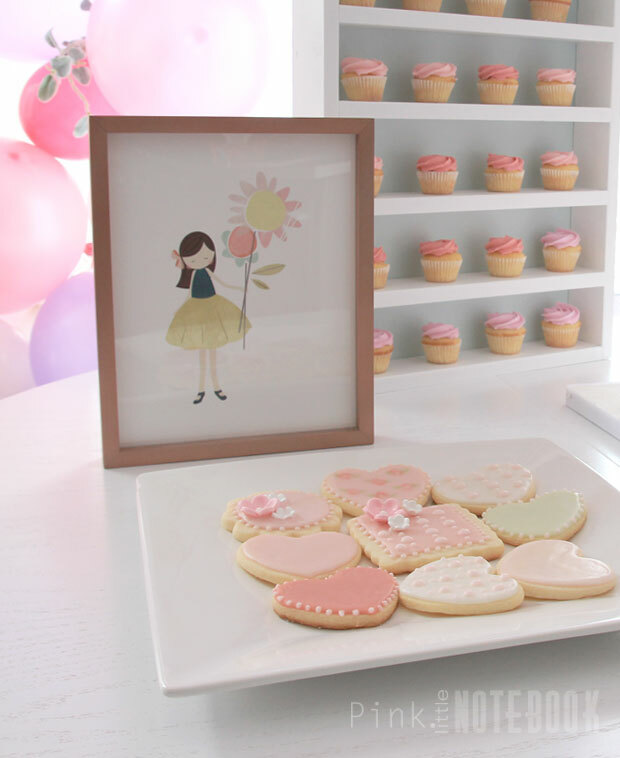 This photo was used to help re-create our amazing cake and cupcake stands. Since our home is not equipped to host a party of 40 people (sitting comfortably anyways), we had to do some rearranging on our main floor. We cleared out all our furniture and rented tables and chairs. 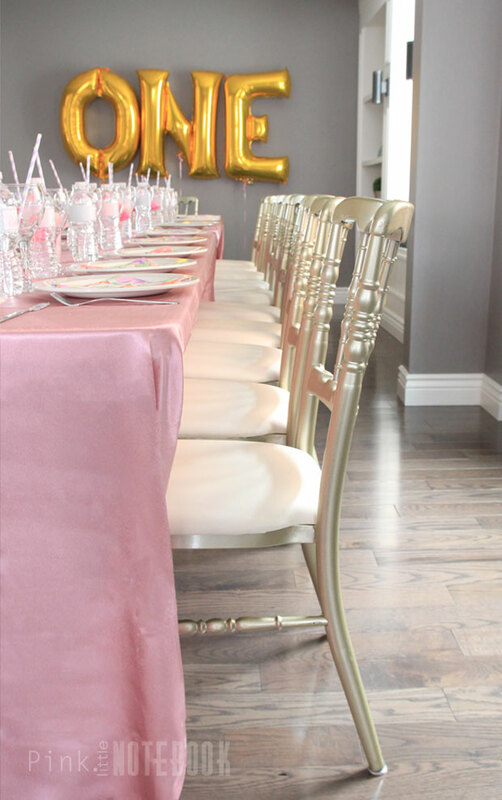 We dressed our tables with gorgeous pink linens and gold Tiffany chairs. 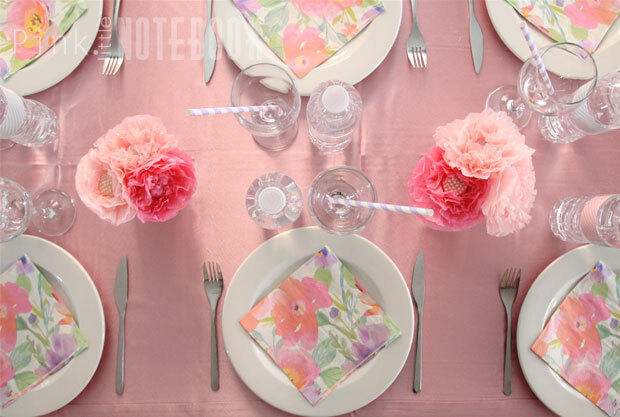 For an extra pop of colour, I arranged these stunning watercolour paper napkins on each place setting. The tissue paper flowers you see on the table; they are actually lollypops! I created mini balloon garlands that were supposed to drape over the tables as centerpieces. I was going to sporadically place my lollypop flowers throughout. However, I realized once I received the tables, that I didn’t have enough room. Instead, I just placed the lollypop flowers in a vase. It was a great little surprise for the kiddies. Being a graphic designer, I love personalized details! 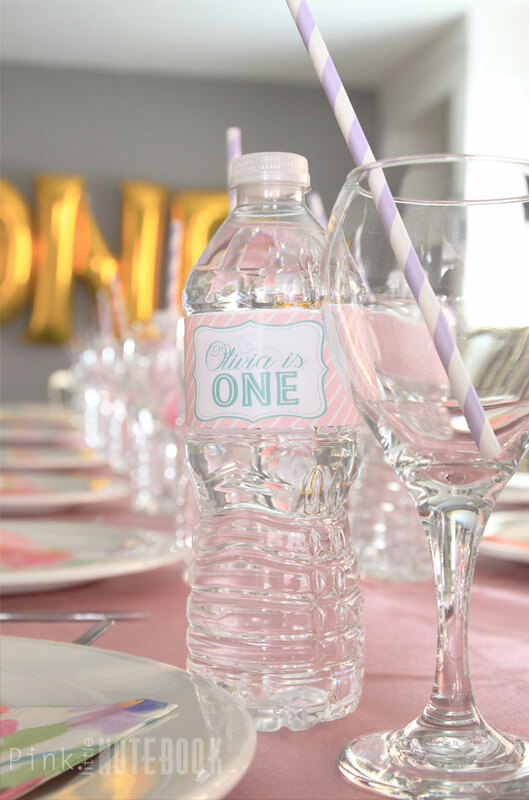 I made fun water bottle labels, which I paired with a lavender striped straw in each water glass. 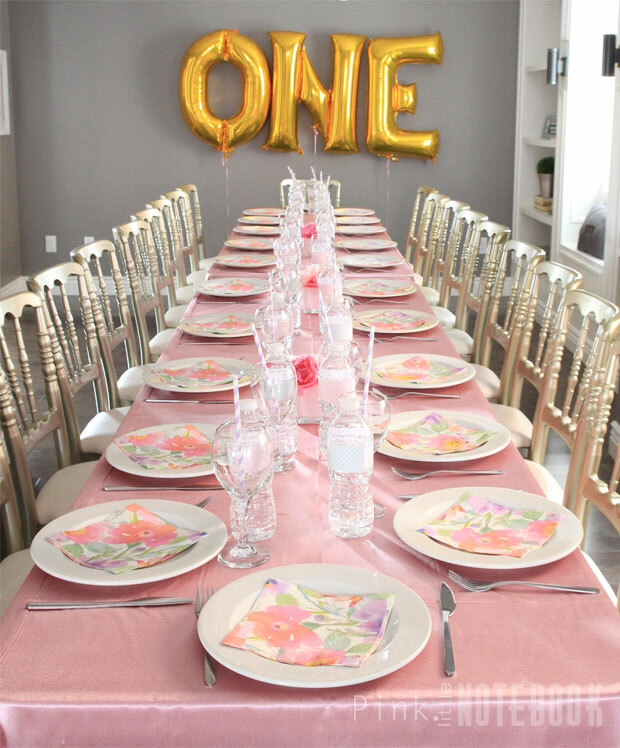 A birthday party isn’t complete without the giant gold foil “ONE” balloons. It made the perfect backdrop to our table. The cake table came out better than I imagined. Those awesome cupcake stands where made by my father-in-law. The balloon arch was an easy DIY project that I created with balloon decorating tape, faux greenery and of course, a lot of balloons. 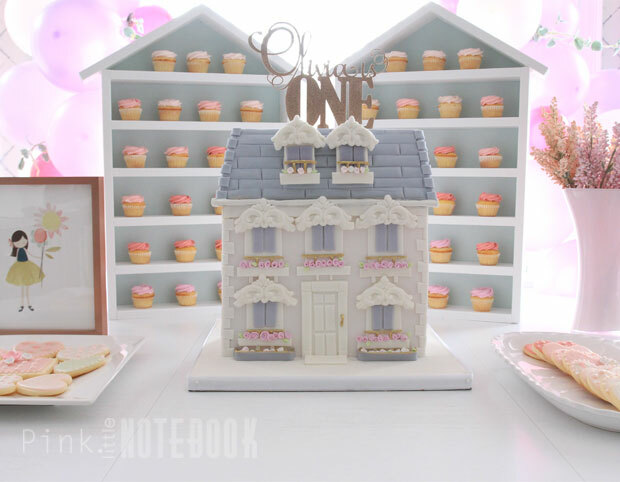 My favourite detail of all—the dollhouse cake. Isn’t it AMAZING!! It kind of broke my heart when it was time to cut and serve the cake. Amy (my cake lady) is super talented at what she does! Although some of my ideas didn’t pan out, I was extremely happy with the outcome. It was definitely worth the effort just to see the expressions on Olivia’s face. Psst, btw those balloons stayed up for two weeks after her birthday party. She just loved them! Disclosure: Thank you to Party City for providing some of the birthday decorations for Olivia’s first birthday. All views, opinion and of course, creativity are truly my own. Olivia is so cute! Love the party you created for her. Beautiful! Wow! Perfect! Simple and beautiful Love it!